You could buy one of these bad boys (no red ring of death, at least). There are many suggestions all over the internet on tackling the Xbox fix. Nothing is guaranteed, but this is a list of things that have worked for me personally (as a long-time console gamer). Here are the best red ring of death “fixes” that you can try before taking a sledgehammer to your old Xbox once and for all. If you’re making a last ditch effort to save your game system before surrendering it to Xbox support, why not give CleanDr a try? Sometimes CleanDr requires more than one repetition (Amazon review) for it to work, but the amount of patience required for the laser to be cleaned is much less than the patience you will need when you open your system for the first time. Perhaps you know someone with just a disc read error rather than Xbox red ring. Have a read on fixing that here. FIX VERDICT: HIGHLY RECOMMENDED. LOW RISK, LOW COST. [FULL DISCLOSURE: DI MAKES THIS PRODUCT]. A can of compressed air can work wonders when you open your disc tray, especially if lint is caught below it. The key is to blast dust OUT of the tray, so approach from an angle rather than blowing directly in. Worth a try, right? Now, it’s pretty certain that you still have red ring going. Time to open up your Xbox and have a look under the hood. It really doesn’t take long for dust and other junk to settle inside your console. A piece of lint sitting in the wrong spot or dust clogging the cooling fans are surefire ways to start experiencing error messages and flashing red rings. Opening up an Xbox isn’t the hardest thing in the world if you do not have anger issues and have the right tools. You might not get the cover off on the first try, but once the system is open – get your canned air and paintbrushes going and clean the system out. Here is the absolute BEST best Xbox 360 opening/cleaning guide I’ve seen on this process. It details all the tools and has great pictures to follow along with. This tip should get you much closer to curing RROD. FIX VERDICT: MODERATE DIFFICULTY, TOOLS REQUIRED TO OPEN XBOX. WORTH IT. You found this blog post because your search skills for Xbox fixes are pretty savvy. If the first two tips failed you, consider heading over to Reddit, Xbox Experts, or WikiHow for some other ideas. Still not satisfied? Network with some local repair guys that specialize in taking Xbox 360s apart for the red ring of death. The system is nearly a decade old now, so you should be able to negotiate a fix for under $50. FIX VERDICT: VARIED RESULTS. VARIED COST. ALSO, STRANGER DANGER. Having done this myself, you need to be extremely patient. Also realize that breaking the silver seal on the inside of your Xbox voids any warranty or repair discounts you may have received from simply sending your system in. But if this is your first time getting the red ring of death, there’s a good chance this tip will revive your Xbox for at least another month if you follow the instructions exactly. FIX VERDICT: MODERATE DIFFICULTY, MIXED RESULTS. This is a temporary fix if your red ring of death has come right as you unwrapped the packaging on FIFA15 and are ready to just punish that stupid game box. Grab four or five towels. Remove any games, hard drives, or controllers. Then, wrap your Xbox 360 with the towels completely. Plug your system into the wall socket and let it run for 20 minutes. Keep an eye on it, as there is a small risk of electrical fire because you are essentially overheating the system a great deal to try and “re-warp” the motherboard back into place. Unwrap, turn it off, and let it cool for another 20 minutes. It should power back on like normal if you are patient. If this red ring tip gives you some red flags, it’s because it’s a terrible idea and only seems to work for a day or two. Then the red flashes return, and your real-life wanted level jumps up to five stars from the carnage you decide to cause. FIX VERDICT: NOT RECOMMENDED. CRUEL TO BOTH YOUR XBOX AND THOSE NICE TOWELS FROM KOHL’S. The Xbox 360 is so great. If it weren’t for the Xbox red ring, it might be the best overall console to come out after the world-renowned PS2. But sometimes, rather than getting it repaired or paying Xbox a hundred dollars because the warranty expired three Call of Duty games ago (1 Call of Duty per year, get it? )… the best option is to toss that cursed machine off the balcony. Then, pick up an outdoor activity like cheese rolling and you’ll be set for life. 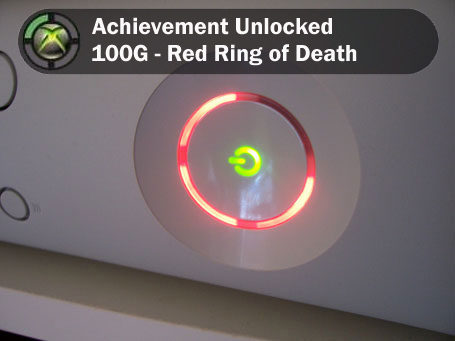 Xbox red ring is no fun. I hope you find some temporary luck with the options I’ve laid out for you here. Still frustrated and need to vent? Drop me a line in the comments. I’m still going to try and sell you CleanDr; there’s no getting around that.